Does Video Quality Really Matter? You can find the almost three minute video at: https://www.youtube.com/watch?v=70MTvxFzZ-Y. Unfortunately it’s in Korean with no subtitles, a likely intelligence indicator of who the target audience for the video is. After watching the sepia toned mélange of photos and clips, it seems to me that the audience is like to be North Koreans. 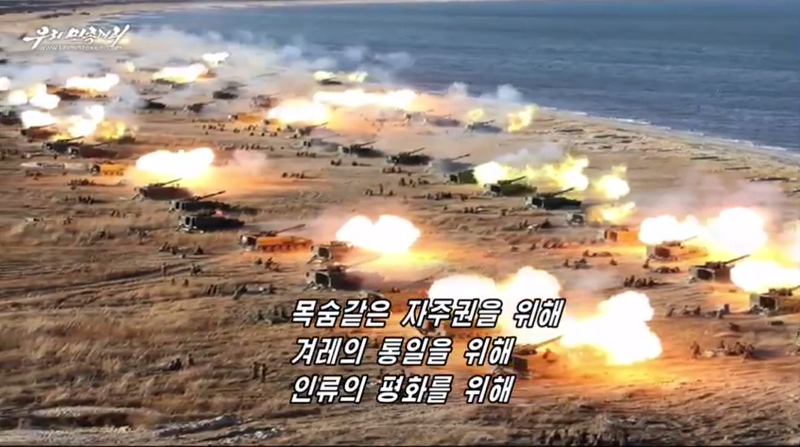 While not being able to understand the dialogue, it seems to me that the intent of the video is to convince the view that the North Koreans will prevail against the meagre weapons of the decadent West. While the quality is supposed to be the same as ‘professional’ news organizations, it would not likely pass for a product from an advanced news agency such as the BBC or US outlets. In my opinion, it really doesn’t matter. 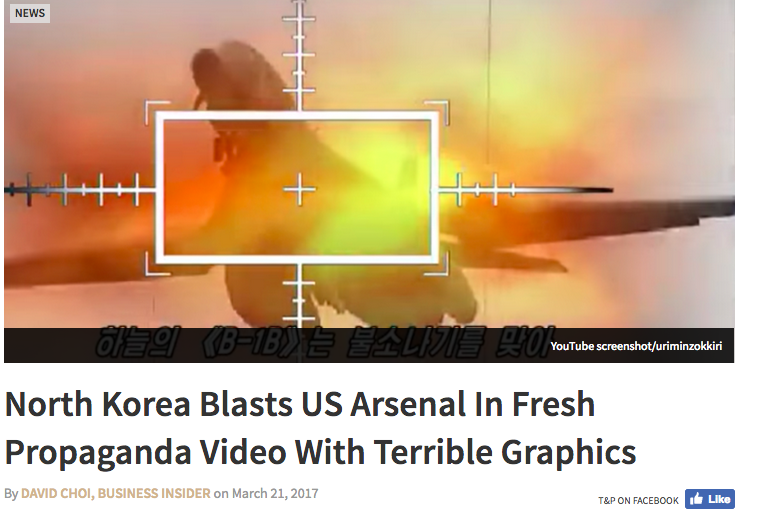 The North Korean viewing public is a captive audience and likely has lower standards in terms of video production that those outside the country who have access to other news sources. Another principle at work here is that it is harder to change someone’s mind than it is to reinforce an existing opinion. North Koreans have been conditioned to accept government information as truth for generations so that the government can control the content and flow of information that their citizens receive. The same work product would likely have little effect on Western Viewers who are able to explore a variety of alternative sources including www.defense.gov and military defense contractors such as http://www.lockheedmartin.com/ or their competitors such as: BAE Systems, Boeing, Cassidian (Airbus Military), Dassault Group, Eurofighter Jagdflugzeug GmbH, Finmeccanica, General Dynamics, Northrop Grumman, Panavia Aircraft GmbH, Raytheon, and SAAB AB. Reader feedback welcome as always. If MI is Deploying A Bde HQ – What About PSYOP/MISO? I knew I was under the gun to post something today and was concerned I couldn’t find anything of interest until I found this piece of ‘news’. 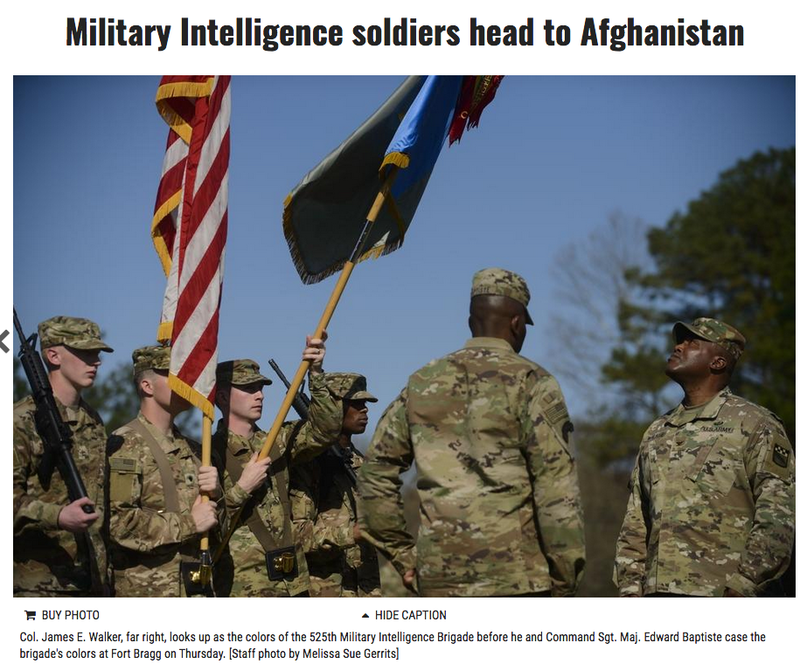 On March 10, 2017 the Fayetteville (NC) Observer published an article headed “Military Intelligence soldiers head to Afghanistan” (see: http://www.fayobserver.com/news/20170309/military-intelligence-soldiers-head-to-afghanistan; which is also the photo source). The article noted: “The brigade will assume the mission of Task Force Observe, Detect, Identify and Neutralize (ODIN), which is an Army aviation battalion chartered in 2006 to conduct reconnaissance, surveillance and target acquisition operations to defeat the threat of improvised explosive devices. I cannot comment on whether all of these developments are related, however, it does seem pretty clear that the OpTempo is picking up yet again. Given the current MISO Force strategy wherein the USAR PSYOP Groups support ‘the Big Army” and the active MISO Force supports Special Operations Forces this can only mean more action for both. The MISO community is a small one and any OpTempo increase impacts the entire community. 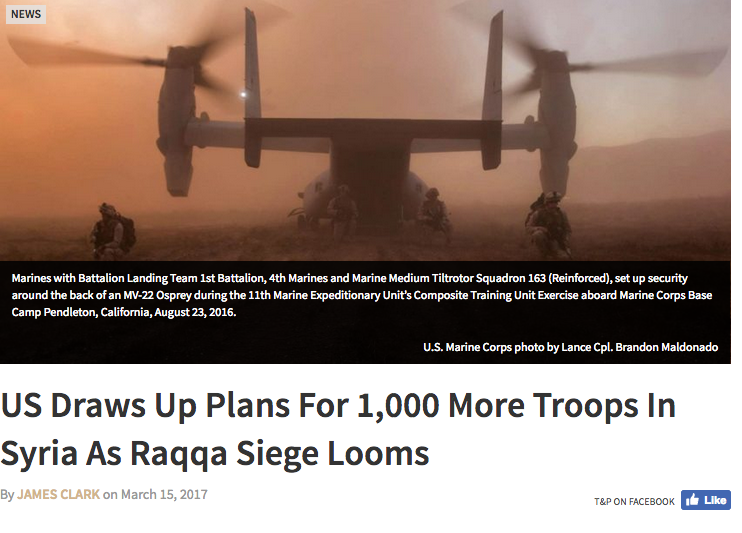 This puts more pressure on the Reserve Force whose members have deployed extensively to Iraq and Afghanistan. These deployments have put pressure on families that may translate into a reduced Reserve force as family members are fatigued with prolonged absences and reenlistments decline preciptiously. From a career perspective, even though Reserve soldiers have the protection of the Uniformed Services Employment and Reemployment Rights Act of 1994 (USERRA) many careers have been torpedoed by repeated absences that are often not offset by comparable increases in health care and pension benefits. Experience has shown that dominating the influence battlefield is the key to long-term victories. Iraq has clearly shown that failure to work with the country’s population and prepare them to help rebuild their will lead to yet more conflict. 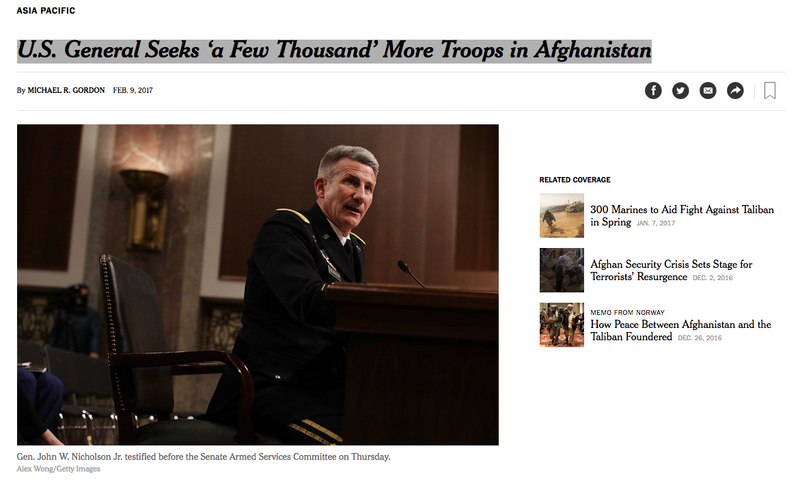 Notwithstanding the impact on the Force, it would seem that America’s longest war in Afghanistan is nowhere close to ending. One wonders if we have learned our lessons from both Iraq and Afghanistan and if current our military strategy is putting as much emphasis on influence warfare as it seems to be on military operations and training. Failure to help mature the media landscape to help foster peace and prosperity in Afghanistan and Iraq may turn out to be more catastrophic in the long run than any lapse in military expertise. On March 2, 2017 the Brookings Institute ran an article “Disinformation campaigns target tech-enabled citizen journalists” (see: https://www.brookings.edu/blog/techtank/2017/03/02/disinformation-campaigns-target-tech-enabled-citizen-journalists/?utm_campaign=Brookings%20Brief&utm_source=hs_email&utm_medium=email&utm_content=43768809 which is also the photo source). The article starts out talking about how today’s technology is ubiquitous and plentiful. Consequently almost anyone with a smartphone can become a crusading reporter and expose wrongdoing. This can be especially problematic in countries where governments want to control their citizen’s perception of events. The article talks about a “troll factory’ where disinformation artists are paid to alter the perceptions of citizens by pumping “Out fake information in efforts to obfuscate Russian war crimes in Ukraine and Syria and retaliate against Western investigators. Several disinformation techniques are noted and touched upon. All of this points to the need for more emphasis on countering disinformation efforts. Given the nature of disinformation and the sheer number of participants, perhaps the approach should be a very unPSYOP one – that is employ technical measures. If the Internet of Things (IoT) could be harnessed by criminals to launch Denial of Service attacks (see: https://arstechnica.com/security/2016/10/double-dip-internet-of-things-botnet-attack-felt-across-the-internet/ for example), why couldn’t the same technique be employed as a disinformation jammer? I’ll leave that one to your imagination and your comments. UAVs – The New Commando Solo? I had a bit of writer’s block and a dearth of material for this week’s posting so I decided to just surf around for a while and see what I could come up with. I started with one of the darlings of today’s battlefield – the UAV. For background I found: “Making The Most of New UAV Capabilities in Video/Broadcast Product” (see: http://www.creativeplanetnetwork.com/news/expertise/making-most-new-uav-capabilities-videobroadcast-production/610167; which is also a photo source). The article was published in June 2015. Not exactly old, but not exactly new by Internet standards either. The article provides facts and insights into today’s broadcasting technology and urges the entertainment industry to learn how to employ UAVs in their work. UAVs and MISO are made for each other. It seems to me that we will always need a need to project PSYOP/MISO broadcast products into denied areas. The areas may be denied because of the tactical situation the geography or because of a natural or man-made disaster. UAVs could be used to recon a new AO from a PSYOP/MISO perspective. This would include obtaining imagery of billboards, posters and graffiti. It could also include surveying an urban area to determine the density of satellite dishes and traditional TV antennas. 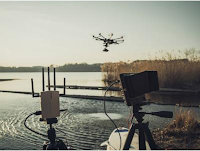 If the current media landscape is unsuitable or uncooperative UAVs might be able to offer flexibility in delivering the message to the target audience employing an alternative transmission schema. The Predator is a formidable weapons system. 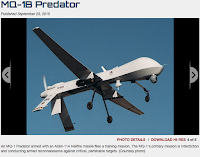 You can find the official US Air Force fact sheet at: http://www.af.mil/AboutUs/FactSheets/Display/tabid/224/Article/104469/mq-1b-predator.aspx (also a photo source). While originally used for surveillance and reconnaissance, the Hellfire Missile equipped UAV has been credited with a number of very successful terrorist attacks. Consequently a little creativity can help leverage the presence of even an unarmed UAV as a Psychological Act. Of course the AO’s ROE will impact the use of UAVs and an emerging body of law concerning them, especially their impact on privacy may also factor into their use. only scratching the surface of their potential.